This new collection of essays by distinguished international scholars and clinicians will revolutionize your understanding of madness. 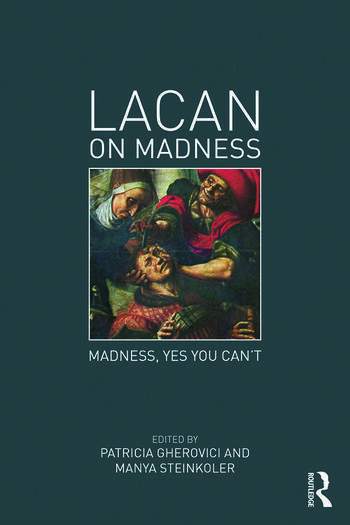 Essential for those on both sides of the couch eager to make sense of the plethora of theories about madness available today, Lacan on Madness: Madness, Yes You Can’t provides compelling and original perspectives following the work of Jacques Lacan. Patricia Gherovici and Manya Steinkoler suggest new ways of working with phenomena often considered impermeable to clinical intervention or discarded as meaningless. This book offers a fresh view on a wide variety of manifestations and presentations of madness, featuring clinical case studies, new theoretical developments in psychosis, and critical appraisal of artistic expressions of insanity. Lacan on Madness uncovers the logics of insanity while opening new possibilities of treatment and cure. Intervening in current debates about normalcy and pathology, causation and prognosis, the authors propose effective modalities of treatment, and challenge popular ideas of what constitutes a cure offering a reassessment of the positive and creative potential of madness. Gherovici and Steinkoler’s book makes Lacanian ideas accessible by showing how they are both clinically and critically useful. It is invaluable reading for psychoanalysts, clinicians, academics, graduate students, and lay persons. Part 1: Mad About You: Treatment of Madness. Flor, "The Case of the Baby Diaper Man". Morel, "Ilse or the Law of the Mother". Dana, "From Psychotic Illness to Psychotic Existence: On Re-Inventing the Institution". Gherovici, "The Art of the Sinthome: Joyeuse de Chocolat", Nobus, "On Mind Forg'd Manacles and Mad Monarchs". Part II: The Method in Madness: Theorizing Psychosis. Leader, "What is Manic Depression?" Grigg, "Melancholia without Mourning". Vanhuele, Fayerts, "Madness, Mirror Images and Subjectivity: On Merleau Ponty and Lacan". Yankelvich, "Narcissistic Madness". Pickmann, Raving Mad. Maleval, "Psychosis and Contemporary Psychoanalysis. Braunstein, "You Cannot Choose to go Crazy. "Allouch, "Transference in Psychosis", Part III: Nut-so Mad: Madness and Creation.Whitworth, "Singing the Failure of Meaning: Crashaw: Baroque Poetry", Mieli, "Primo Levi: Sleeping Beauty in the Fridge". MacCannell, "Woolf and Joyce: The Writing Ego", Cameron, "Madness or Mimesis: Narrative Impasse in the novels of Samuel Beckett". Steinkoler, "On Reading the Real: Schizophrenic Writing". Patricia Gherovici is a psychoanalyst and analytic supervisor. Her books include The Puerto Rican Syndrome (Other Press, 2003) winner of the Gradiva Award and the Boyer Prize, and Please Select Your Gender: From the Invention of Hysteria to the Democratizing of Transgenderism (Routledge, 2010). Manya Steinkoler is a psychoanalyst in formation at Après-Coup New York and a professor in the Department of English at Borough of Manhattan Community College. "A fascinating collection of essays on the ever-crucial topic of madness in civilization and in the consulting room. The authors here serve us up a fine antidote to the thinking behind the DSM-V." - Bruce Fink, practicing Lacanian psychoanalyst and analytic supervisor. He is a member of the Ecole de la Cause freudienne in Paris and an affiliated member of the Pittsburgh Psychoanalytic Center.